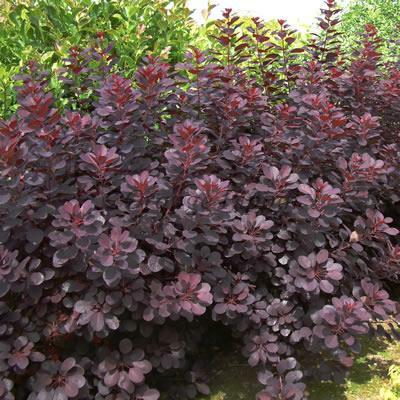 Cotinus coggygria, known as the 'Smoke Bush' has given rise to Cotinus coggygria 'Royal Purple' which has magnificent, purple-red, rounded leaves which turn a vibrant red in the autumn. This non-evergreen, multiple-branching, upright growing shrub bears clouds of fluffy-looking, deep-pink-purple flowers during July and August which appear like a haze of smoke from a distant, hence the name. This beautiful Cotinus is best planted in a sunny position alone as an eye catching specimen, or within a shrub or mixed border.